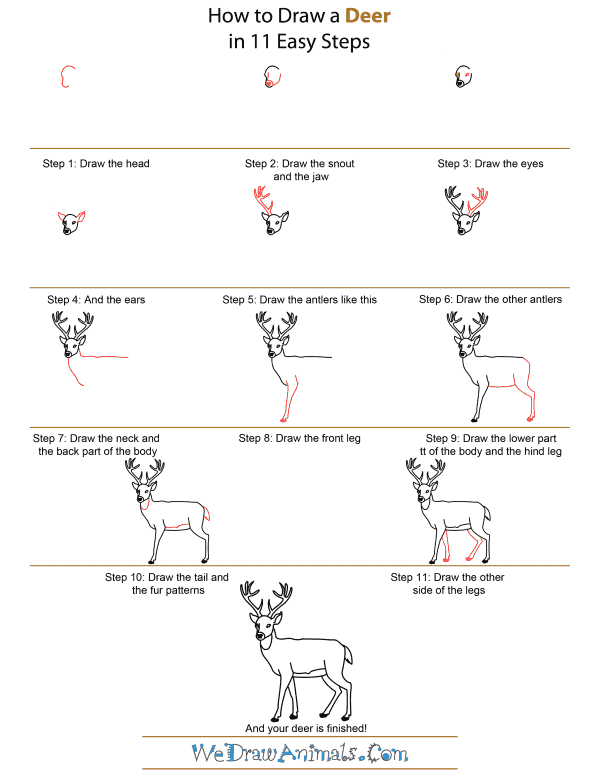 In this quick tutorial you'll learn how to draw a Deer in 11 easy steps - great for kids and novice artists. 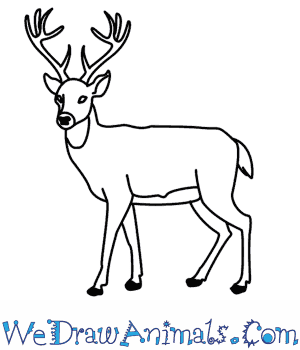 At the bottom you can read some interesting facts about the Deer. 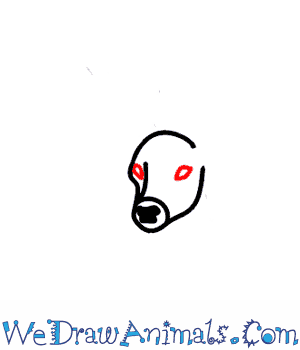 Step 1: Start by drawing the head. It is the shape of your ear. 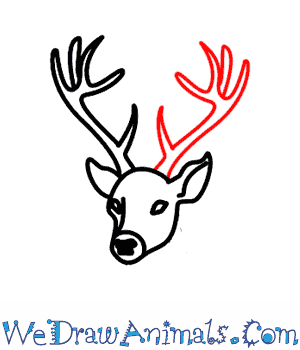 Or a sideways "W" with the top side much rounder than the bottom side. Step 2: At the center of the bottom of the face line draw the large black nose. Continue the bottom curve upward to create the bottom jaw line. Step 3: Now we add the eyes on the two sides of the face. 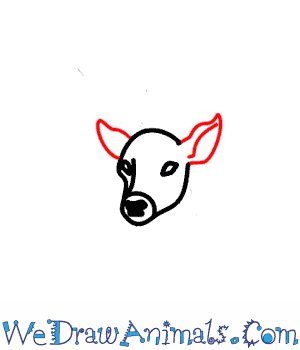 Step 4: Next we add the pointy ears on either side of the head. 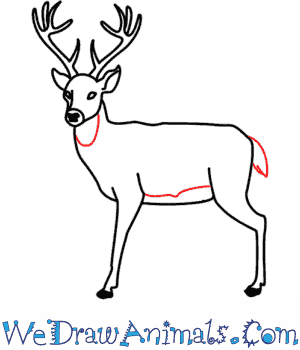 Step 5: Draw the first antler on the left side of the top of the head. Think of a tree branch. There is a short branch just above the head. The longer branch continues upward at an angle with four small branches at the top. 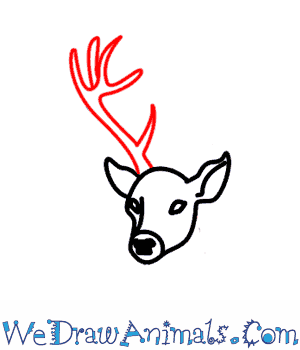 Step 6: Now draw the second antler from the top of the right side of the head. Make sure it looks exactly like the first one in reverse. 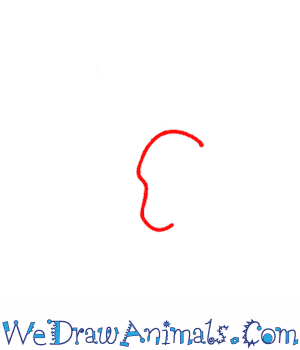 Step 7: Starting at the bottom of the right ear draw a short line down. Sharply bend the line to the right and continue straight across. 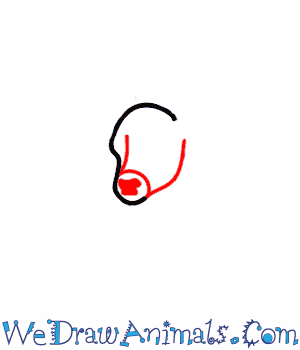 Draw a curved line down from the bottom of the snout. Step 8: Draw the front leg where the neck line ends. Front legs are long and thin. Don't forget the black hoof at the bottom. Step 9: Next draw the belly and the back leg. The back leg continues down from the back line. The top part of the leg is curved but the bottom part is straight and thin. Don't forget the black hoof at the bottom. Step 10: Draw the small tail at the tip of the rump. Add the fur patterns along the belly and neck. Step 11: Finally, add another front leg just behind the first one. Add another back leg in front of the other back leg. Deer roam lands over most of the world. They belong to the Cervidea family of mammals that include the white-tailed deer, elk, moose, several mule deer and the reindeer, also known as caribou. Fossils of deer found in France date back about 35 million years. 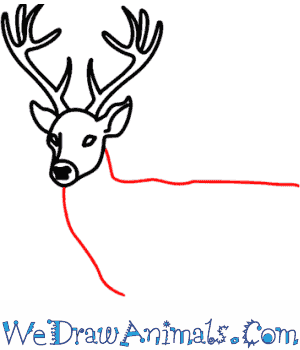 Deer have been the subjects of mythology, Christmas folklore, art, literature, religion, and movies. 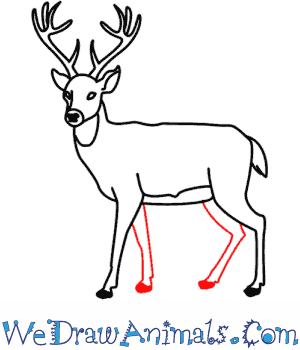 The meat, which is called venison, and hides of deer have provided humans with food, clothing and shelter. Indian tribes often used deer hides to make their teepees. The smallest species of deer weighs about 20 pounds, while the largest, the moose can weigh up to 1,000 pounds. A doe will have usually give birth to one or two fawns and will care of her babies alone. A fawn will take its first steps within 20 minutes of being born. 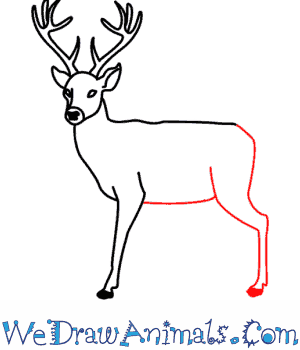 Most male deer have antlers and female reindeer are the only female deer that have antlers. 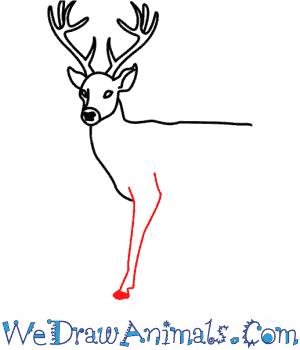 Deer are beautiful and graceful creatures that are popular with hunters and nature lovers everywhere.